Walter E. Fernald State School, Waltham, MA. The Walter E. Fernald State School, later the Walter E. Fernald Developmental Center (aka Fernald Developmental Center or simply Fernald), was the Western hemisphere's oldest publicly funded institution serving people with developmental disabilities. Originally a Victorian sanatorium, it became a "poster child" for the American eugenics movement during the 1920s. It later was the scene of medical experiments in the 20th century. Investigations into this research led to new regulations regarding human research in children. The school occupies a 186 acres (75 ha) property off Trapelo Road in Waltham, Massachusetts. The Fernald Center, originally called the Experimental School for Teaching and Training Idiotic Children, was founded by reformer Samuel Gridley Howe in 1848 with a $2,500 appropriation from the Massachusetts State Legislature. The school eventually comprised 72 buildings total, located on 196 acres (0.79 km2). At its peak, some 2,500 people were confined there, most of them "feeble-minded" boys. Under its third superintendent, Walter E. Fernald (1859–1924), an advocate of eugenics, the school was viewed as a model educational facility in the field of mental retardation. It was renamed in his honor in 1925, following his death the previous year. The institution was involved in several different procedures that used the residents as test subjects some of which include sterilization and radiation experimentation. The institution did serve a large population of mentally retarded children, but The Boston Globe estimates that upwards of half of the inmates tested with IQs in the normal range. In the 20th century, living conditions were spartan or worse; approximately 36 children slept in each dormitory room. There were also reports of physical and sexual abuse. The experiment was conducted in part by a research fellow sponsored by the Quaker Oats Company. MIT Professor of Nutrition Robert S. Harris led the experiment, which studied the absorption of calcium and iron. The boys were encouraged to join a "Science Club", which offered larger portions of food, parties, and trips to Boston Red Sox baseball games. The 57 club members ate iron-enriched cereals and calcium-enriched milk for breakfast. In order to track absorption, several radioactive calcium tracers were given orally or intravenously. Radiation levels in stool and blood samples would serve as dependent variables. In another study, 17 subjects received iron supplement shots containing radioisotopes of iron. Neither the children nor their parents ever gave adequate informed consent for participation in a scientific study. In 1946, one study exposed seventeen subjects to radioactive iron. The second study, which involved a series of seventeen related subexperiments, exposed fifty-seven subjects to radioactive calcium between 1950 and 1953. It is clear that the doses involved were low and that it is extremely unlikely that any of the children who were used as subjects were harmed as a consequence. These studies remain morally troubling, however, for several reasons. First, although parents or guardians were asked for their permission to have their children involved in the research, the available evidence suggests that the information provided was, at best, incomplete. Second, there is the question of the fairness of selecting institutionalized children at all, children whose life circumstances were by any standard already heavily burdened. It has been claimed that the highest dose of radiation that any subject was exposed to was 330 millirem the equivalent of less than one year's background radiation in Denver. A 1995 class-action suit resulted in a 1998 District court decision awarding the victims a $1.85 million settlement from MIT and Quaker. The school also participated in studies of thyroid function in patients with Down Syndrome and their parents. This study showed that their iodine metabolism was similar to normal controls. This situation changed in the 1970s, when a class action suit, Ricci v. Okin, was filed to upgrade conditions at Fernald and several other state institutions for persons with mental retardation in Massachusetts. U.S. District Court Judge Joseph Louis Tauro, who assumed oversight of the case in 1972, formally disengaged from the case in 1993, declaring that improvements in the care and conditions at the facilities had made them "second to none anywhere in the world". A result for Fernald residents of the class action suit which took effect in 1993 was the provision of "a guaranteed level of care, regardless of cost, to compensate for decades of neglect and abuse". 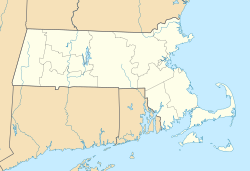 The buildings and grounds survived into the 2000s as a center for mentally disabled adults, operated by the Massachusetts Department of Mental Retardation. In 2001, 320 adults resided at Fernald, with ages ranging from 27 to 96 years and an average age of 47 years. According to a December 13, 2004 article in the Boston Globe, Massachusetts Governor Mitt Romney announced in 2003 that the facility would be closed and the land sold by 2007. In 2003, a coalition of family advocates and state employee unions began a campaign to save Fernald and asked Judge Tauro to resume his oversight of the "Ricci v. Okin" class action lawsuit that had led to improvements at Fernald and the other state facilities beginning in the 1970s. In an August 14, 2007 ruling, Judge Tauro ordered the Department of Mental Retardation to consider the individual wishes of all 185 institution residents before closing the facility. However, in September 2007, the new administration of Governor Deval Patrick appealed Tauro's ruling to the First Circuit U.S. Court of Appeals in Boston. In a statement, the Patrick administration contended that Fernald had become too expensive to continue to operate and that equal or better care could be provided in private, community-based settings for the remaining Fernald residents. The administration's cost claims have been disputed by the Fernald League for the Retarded, Inc., the Massachusetts Coalition of Families and Advocates for the Retarded, Inc. (COFAR) and other family-based organizations, which have continued to advocate for the preservation of Fernald as a site for ICF/MR-level care for its current residents. Those advocacy organizations have proposed a "postage-stamp" plan under which Fernald would be scaled back in size and the remaining portion of the campus sold for development. The Patrick administration, however, has declined to negotiate with those Fernald advocates, and has pressed ahead with its appeal and closure plans. A significant portion of the Waltham campus, encompassing its facilities established through Fernald's tenure, was listed on the National Register of Historic Places in 1994. Fernald was the subject of a 2007 documentary film "Front Wards, Back Wards" directed by W.C. Rogers, which has been shown on some PBS television stations. As of June 2013[update], Fernald remained open with 13 residents living on grounds, the oldest of whom was 84 years old and a resident since the age of 19. It was reported to cost approximately US$1,000,000 per client per year, or about four times the United States national average for state-supported institution. The Fernald Center's last resident was discharged on Thursday, November 13, 2014, after a protracted legal and political battle which cost the Commonwealth of Massachusetts over $40 million in additional costs over the projected closure date of 2010. Remaining residents were integrated into community services or other state-operated programs. The land was purchased by the city of Waltham, which is exploring the possibility of a new high school on the site. The state sold the property to the city of Waltham in 2014 for $3.7 million, retaining some rights to profit from future leases. and with some historical preservation conditions. As of 2018, despite considering use of the property as a high school or police station, it remains unused. Belchertown State School, a similar state institution that existed from 1922-1992 and was built to alleviate overcrowding at Wrentham and Fernald. ^ "The Walter E. Fernald Association". Retrieved 2009-06-09. ^ a b c Ansberry, Clare (29–30 June 2013). "At Nation's Oldest Institution For the Disabled, 13 Lives in Limbo". The Wall Street Journal (paper). pp. A1, A6. ^ "Fernald State School - Asylum Projects". www.asylumprojects.org. Retrieved 2017-01-31. ^ "disability history museum--Letters and Journals of Samuel Gridley Howe". www.disabilitymuseum.org. Retrieved 2017-01-31. ^ Johnson, Glen (12 October 2009). "Apology sought for abuse at Fernald School". The Daily News Tribune. Gatehouse Media Inc. Retrieved 2 November 2009. ^ BRONNER F, HARRIS RS, MALETSKOS CJ, BENDA CE (January 1956). "STUDIES IN CALCIUM METABOLISM. THE FATE OF INTRAVENOUSLY INJECTED RADIOCALCIUM IN HUMAN BEINGS". The Journal of Clinical Investigation. 35 (1): 78–88. doi:10.1172/JCI103254. PMC 438780. PMID 13278403. ^ "OT-19. Radioisotope Studies at the Fernald State School, Massachusetts". Retrieved 2017-06-24. ^ SHARPE LM, PEACOCK WC, COOKE R, HARRIS RS (July 1950). "The effect of phytate and other food factors on iron absorption". The Journal of Nutrition. 41 (3): 433–46. PMID 15428911. ^ "Chapter 7: The Studies at Fernald School". ACHRE Report. It is clear that the doses involved were low and that it is extremely unlikely that any of the children who were used as subjects were harmed as a consequence. ^ Hussain, Zareena (January 7, 1998). "MIT to pay $1.85 million in Fernald radiation settlement". The Tech. 11 (65). Retrieved 2009-06-09. ^ Hussain, Zareena (January 7, 1998). "MIT to Pay Victims $1.85 Million in Fernald Radiation Settlement". MIT. Retrieved 22 February 2012. ^ KURLAND GS, FISHMAN J, HAMOLSKY MW, FREEDBERG AS (April 1957). "Radioisotope study of thyroid function in 21 mongoloid subjects, including observations in 7 parents". The Journal of Clinical Endocrinology and Metabolism. 17 (4): 552–60. doi:10.1210/jcem-17-4-552. PMID 13406017. ^ "MACRIS inventory record for Walter E. Fernald School". Commonwealth of Massachusetts. Retrieved 2014-04-25. ^ "Front Wards, Back Wards". Georgia Public Broadcasting. 2009-04-28. Retrieved 2017-01-31. ^ "Front Wards, Back Wards | ITVS". itvs.org. Retrieved 2017-01-31. ^ Josh Kovner (December 3, 2014). "Opposing Sides Clash As Debate Resumes Over Closing Southbury Training School". Hartford Courant. Retrieved January 18, 2015. Molly Cole, who directs the disabilities council, pointed to an institution in Massachusetts, the Walter E. Fernald Developmental Center, that was finally shut by the Bay State last month. ^ Ralph Edwards (November 19, 2014). "Closing of Fernald Developmental Center". TASH. Retrieved January 18, 2015. On Thursday, November 13, 2014, Fernald Developmental School closed its doors. D'Antonio, Michael. The State Boys Rebellion. New York: Simon & Schuster, 2004. Wikimedia Commons has media related to Walter E. Fernald State School. This page was last edited on 22 April 2019, at 11:53 (UTC).